Herzog & de Meuron first unveiled plans for the gorgeous solar-powered Stade de Bordeaux in 2011 – and they just broke ground on it last week! The Swiss architecture firm designed the airy stadium complex for the Euro 2016 football championship. Set to be completed by 2015, the 43,500-seat stadium features a massive solar photovoltaic plant that will harness electricity for sports games as well as the area surrounding the stadium. 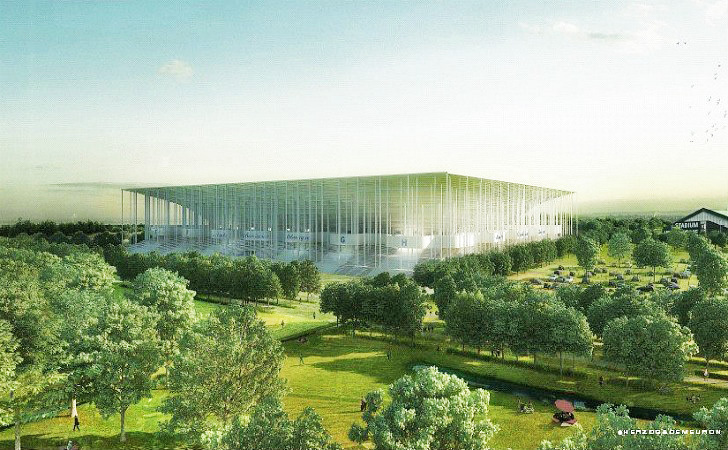 Herzog & de Meuron just began work on the foundation of the stadium, which is located in Bordeaux’s Lac quarter (also known as the green belt district). The area was partially chosen for its accessibility – it can be easily reached via public transportation. Although the project was spurred by the Euro 2016, the completed stadium will also serve as the headquarters of the Girondins de Bordeaux team year round. Herzog & de Meuron designed the stadium to be open and airy, and to connect sports fans to the lush environment outdoors. A square canopy roof will be supported by hundreds of slender white poles that mimic trees in a forest. French landscape architects Michel Desvigne and Vinci-Fayat will create a gorgeous grounds surrounding the stadium, which also sits next to a lake. A concave roof will open up to the sky while protecting seated areas from the elements. 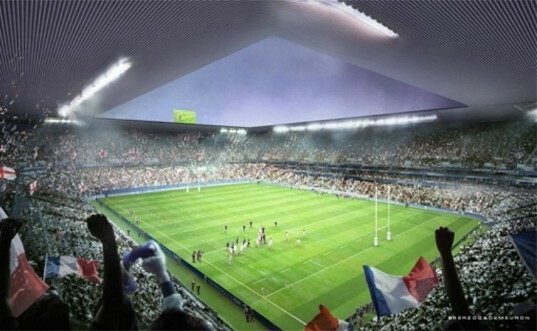 Construction is anticipated to be completed in 2015, with plenty of time for the Girondins to move in before the Euro 16. Herzog & de Meuron first unveiled plans for the gorgeous solar-powered Stade de Bordeaux in 2011 - and they just broke ground on it last week! The Swiss architecture firm designed the airy stadium complex for the Euro 2016 football championship. Set to be completed by 2015, the 43,500-seat stadium features a massive solar photovoltaic plant that will harness electricity for sports games as well as the area surrounding the stadium.